A Heater Pad – to seal the film under the tray, once it is stretched & wrapped. This type of transparent packing, makes the product look attractive as well as increases shelf life. 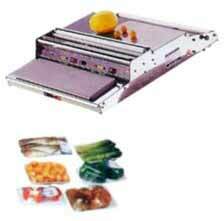 Applications: Fruit, vegetables foodstuffs, sweet packing in trays. Also fish, sea-food packing or any item which needs to be seen through the film wrap – to know its freshness. Machine looks good on department check-out counters, retail shops etc. where on-the-spot food / fruit packing needs to be done. Contact parts made of S.S.